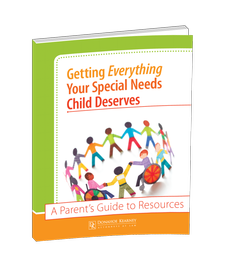 Learn about the resources available for you and your special needs child. Taking care of special needs children is a full-time, around-the-clock occupation. It requires a lot of care and attention from parents who may not have the time and resources. And so we want to make sure parents of special needs or disabled children receive all the help they can get. That is why we have put together an easy to read guide filled with resources available to parents, caregivers, and families with disabled or special needs children. Since we represent disabled children and their families in medical malpractice cases, we are constantly talking to caregivers of disabled children and other people involved in the lives of disabled children. Through this, we learn a lot about the available resources and opportunities for children with serious medical conditions and injuries. We want to make this information available to the people who need it the most. Getting Everything Your Special Needs Child Deserves is available for parents to make sure they can take advantage of all sorts of resources. Included in our guide are all sorts of resources and opportunities: from health care and treatment options to summer camps and recreation options that your child would enjoy. We wanted to make it as easy as possible for you to have a list of available resources in your area to use as a starting point in advocating for your child. Call us today at (202) 323-3320 or order the guide on our website by clicking here.